Giles Norman stands at the summit of black & white photography; world-renowned and boasting a vast international following. Giles Norman is recognised as one of Ireland's leading photographers. With a gallery in Kinsale, Co. Cork, his photographic portfolio spans over 20 years. Choose from an amazing range of distinctive of black and white images. 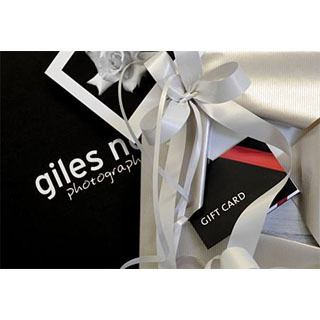 You can order any of the photographs and portfolios we have listed on AllGifts.ie, or you can order a Giles Norman gift voucher on AllGifts.ie, for use as you wish in either of the two galleries, or directly on the website www.gilesnorman.com. The Giles Norman Photographic Galleries base is in a Georgian building spread over 4 floors in the centre of Kinsale. The building is directly behind the car park on Main Street (bottom right of this map). Giles Norman is recognised as one of Irelands leading photographers. There is no minimum value requirement on any Giles Norman Gallery gift voucher. Giles Norman lives just outside of Kinsale, Co. cork with his wife Catherine and their children Jack, Alison and Louis. Born in 1961 to Belgian and English parents, Giles has lived in Ireland since 1976. While completing his formal schooling, a chance request to photograph a school project provided him with his first real opportunity to use a camera. This experience proved to be a very positive one and in 1979 he received his first camera for his 18th birthday. By 1981 he had begun creating his portfolios. Quickly developing his own distinctive style of Black & White photography, Giles began, in 1985, to successfully sell his photographs to craft shops around Ireland. By 1988, to support this demand he rented darkroom space in Kinsale, where a small window to the street drew a steady stream of visitors. This welcome intrusion convinced him to open his first gallery. By selling work from his earliest portfolios of Kinsale, Dublin, Kerry and West Cork (1981-1988), the gallery quickly became successful and gained Giles recognition as one of Irelands leading photographers. This necessitated a move to larger premises 1n 1992, which is now home to the complete portfolios of Giles Norman Photography. In 2006 Giles completed the journey from darkroom to digital and now all of his photos are available as digital prints. 'Moving over to digital has been a natural progression." explains Giles. "Digital technology gives me more freedom to spend behind the camera, concentrating on the creative process that fuels my love of photography." We have added a selection of Giles Norman Photographs from each portfolio. All selections are priced as framed. However, all of these are also available unframed. Please contact us for prices or visit our website. Giles Norman Photographs can be delivered nationally and internationally. Cost of delivery is determined by the size and quantity of pieces ordered, and whether they are framed or unframed. Gift vouchers are posted out free of charge. If you choose delivery, we will contact you regarding delivery charges. If you choose delivery, we will contact you regarding delivery charges. Collection is only available from our Kinsale, Co. Cork gallery.